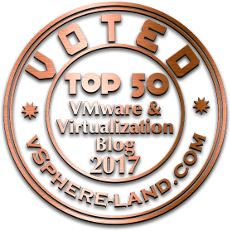 2017 September » Welcome to vSphere-land! With attendance down does this mean VMworld has jumped the shark? 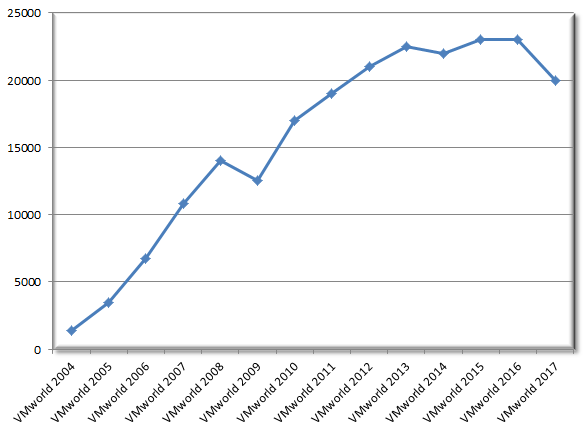 As I reported in my annual post on my experiences at VMworld, attendance was down this year and in a fairly big way. VMware reported attendance at 20,000 this year which is about a 15% decline from the 23,000 who attended in 2015 & 2016. 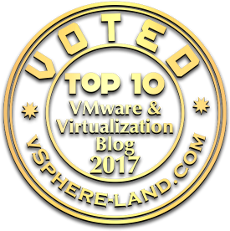 Is this a sign that less people care about what VMware has to offer and have migrated to competing solutions or is there other reasons for the decline this year. I’ll throw out some theories on this but lets first look at what those number mean. People there to support the event – this includes anyone with a booth at the event and is mostly vendors, partners and VARs, typically this is a Booth badge. 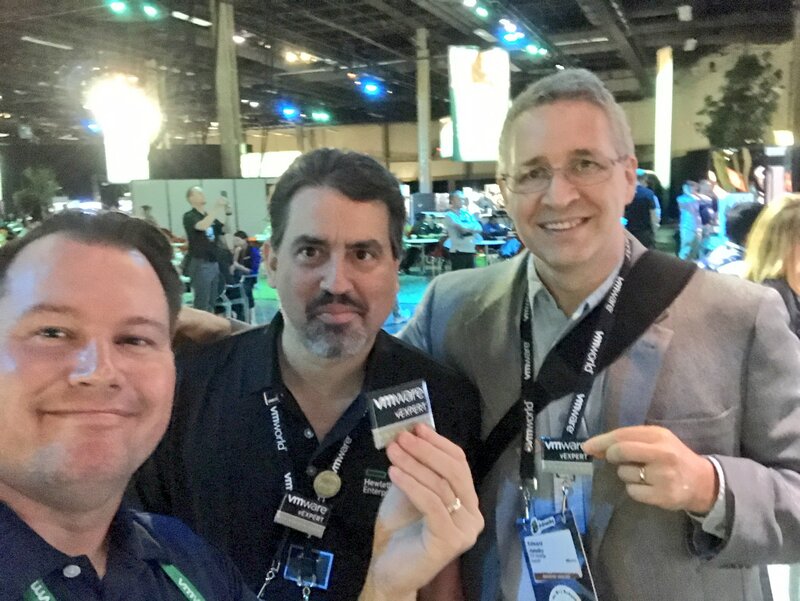 VMware employees there to support the event – this includes those involved in logistics, speaking at sessions, booth duty and more, they typically have VMware employee badges. 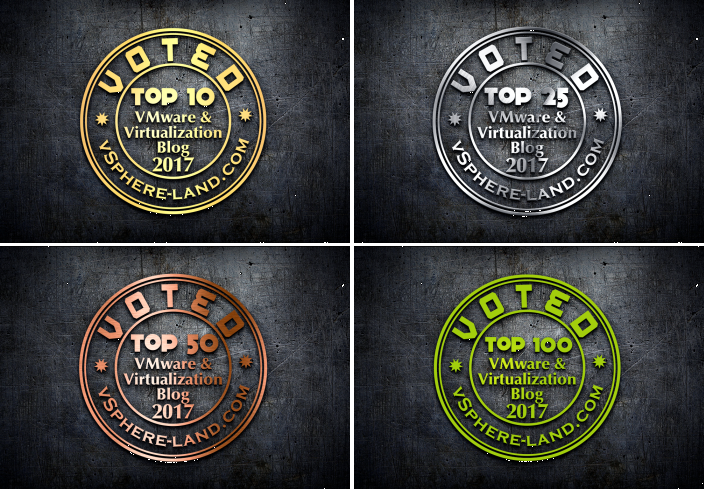 Press, bloggers, analysts – this includes complementary badges for anyone approved by VMware that is associated with external media. Customers – this is anyone that is there as an actual attendee with a paid Full Conference badge. Non-customers – this is anyone from partners/vendors/VARs that paid for a Full Conference badge and are not really there to do booth duty but instead to network and learn. Now VMware has never shared the percentages of badge types that make up the total attendee numbers so without that insight it is difficult to know how much a decline occurred in each of those groups this year. Obviously the important one is the number of customers that attend the event as that is VMware’s core audience for VMworld. So why the decline this year, let’s look at a couple theories and the net result may very well be a combination of some of these. Theory 1 – VMware sent less people to support the event this year. I’m guessing there are thousands of VMware employees that go to this event each year, perhaps VMware simply cut back on the number of internal people they approved for the event. 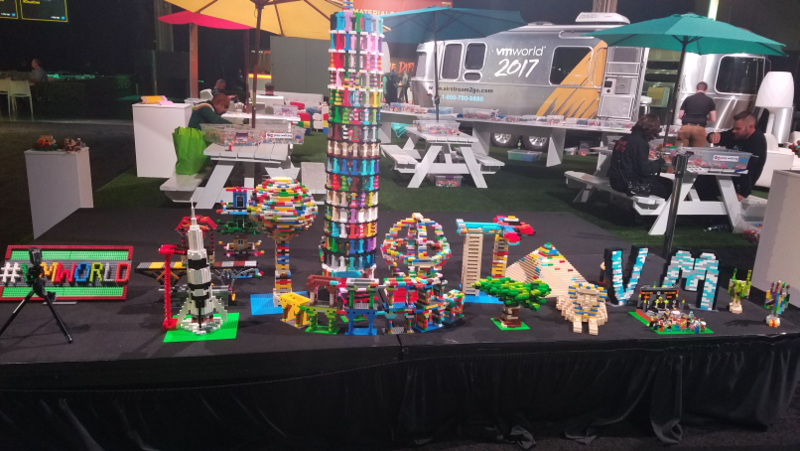 As the event is in no longer in VMware’s back yard in the bay area, most VMware employees need travel expense to attend the event. Theory 2 – Partners sent less people to support the event this year. I think every partner knows the importance of this event and has a presence at it but perhaps they cut back on staffing this year, I personally know on the HPE side we cut back a lot on the staff we sent this year. I’m guessing this group also consists of thousands of people at the event. Theory 3 – Companies have tighter budgets and are tightening belts, travel is often the first thing to get cut when this happens. This can impact many groups including customers, partners and VMware itself. I know as a customer justifying attending these events can be a challenge as companies often see these as paid vacations for employees and don’t understand the true value of attending the events. Theory 4 – More people feel they can experience the event from home. VMware does offer a lot of ways for anyone to experience the event remotely and as a result maybe some people feel they can get what they need from the event without attending it. I had one person reach out to me with a theory that since VMware released all the sessions from VMworld for free last year right after the event this might have resulted in less people attending since they thought they could enjoy all the session content again this year without attending. Notice that VMware hasn’t released the majority of the sessions to the public this year, just a select group of 40 of them. Theory 5 – Hurricane Harvey disrupting travel. Again I know personally of at least 4 people at my company that were stuck in Houston as Harvey hit right before the event and couldn’t attend VMworld as a result. As Houston is the 4th largest city in the US I’m guessing there were at least hundreds of people that had to cancel their plans to attend VMworld because of Harvey. Theory 6 – (thanks Christian for suggesting) VMworld EMEA was only 2 weeks after VMworld US instead of being spaced over a month apart as it has been in the past. This may have resulted in some attendees that typically go to both events only attending EMEA and the EMEA event cannibalizing some potential US attendees. The attendance at the EMEA event was up this year. Again I can see a couple of these theories having an impact on attendance this year, does this mean that this is the new norm for VMworld attendance and VMworld has jumped the shark? Will it decline further next year? Personally I think this year was kind of a fluke like back in 2009 and I fully expect VMworld to be back at the 22K-23K attendance mark next year. VMworld still provides a ton of value for customers, partners and VMware employees to all converge in person and learn from each other. 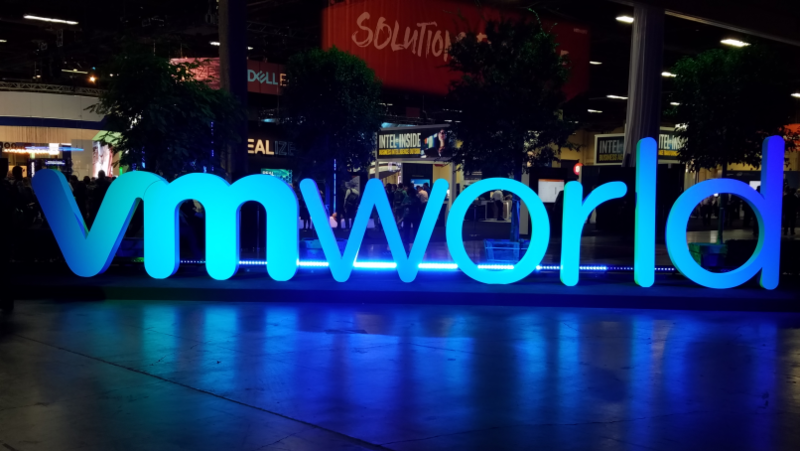 VMware is also expanding their presence, forming new partnerships and touching many other key areas in the IT world so it makes for a larger pool of potential attendees to come to VMworld. Only time will tell though, we’ll see what happens next year but I’m confident in predicting that we will see more people attending VMworld next year, I know I’ll be there and I hope to see you there as well. I’ve known the VVols roadmap for quite a while but haven’t been able to share that publicly but VMware recently just shared it in a VMworld VVols session that is publicly available on YouTube so I though I would comment on that. If you watch the STO2446BU – VMware Virtual Volumes Technical Deep Dive replay you can find this slide near the end of that session (53:11). Support for Microsoft Cluster Server (MSCS) – This was one of the reasons people still use RDMs and is one use case not supported by VVols today. This will help remove another barrier to VVols adoption. Performance parity with VMFS – So this one is a bit misleading as VM workload performance is not really any better or worse with VVols just like the whole VMFS vs. RDM performance argument that used to exist. The I/O data paths and multi-pathing between a host and VVols isn’t really any different with VVols with the exception of the path going through a Protocol Endpoint to get to the VVols. I think what VMware means by performance parity is more just optimizing some of the VVol specific operations like the bind process, VASA connections and how VVols handles metadata to be more efficient. Overall though some aspects of VVols are faster than VMFS such as the whole snapshot mechanism. IPv6 support – vSphere already supports IPv6, this one is specifically for supporting IPv6 on the VASA Provider service. The other things you see there like NFS v4.1 support and in-band bind are being considered for other vSphere releases beyond the next vSphere release. In-band bind has been one that VMware has been trying to do for a while now, today the bind operation happens out-of-band using the control path through the VASA Provider and the goal is to bring it in-band to the data path through the Protocol Endpoint instead. This should improve the efficiency of the bind operation and eliminate a potential failure point. You can read more about this on a post I did about a year ago. 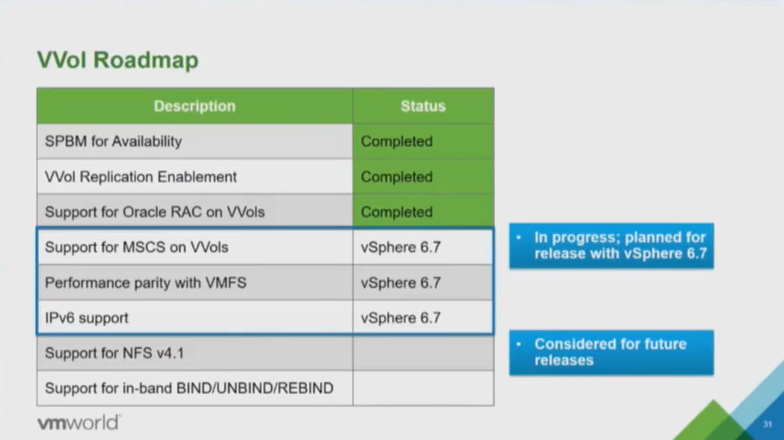 Note while you see vSphere 6.7 mentioned in the slide above, that has not been officially announced or confirmed as the version for the next vSphere release. Once again this year the number of vendors doing giveaways for vExperts at VMworld was pretty small. 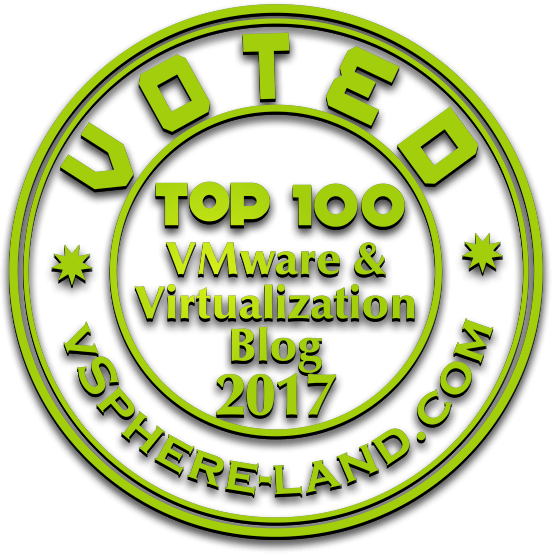 But that’s OK, they sure don’t have to do it but it’s a very nice gesture to the vExpert community. I recently wrote about the top 10 companies that I felt “get” the whole vCommunity thing and a few vendors on that list stepped up and delivered to the vExperts. Cohesity once again had a very generous giveaway with a nice backpack and some other cool swag in it including a nice portable charger. Datrium also went big this year and had another cool geek gift in the form of a Arduboy which is a cool retro portable game device. Also Infinio helped the vExperts be recognized by making some custom buttons with the vExpert logo that they could pin to their lanyards. So a sincere thank you from me to these companies for doing this. I have a confession to make, I don’t really miss having VMworld in San Francisco one bit, Vegas is so much better equipped to handle large conventions than San Francisco is, especially when it comes to hotel rooms. Like Vegas or not Mandalay Bay is a great venue to have VMworld in, it is very spacious to easily accommodate 23,000+ attendees and everything is under one roof and easily accessible. If you do like Vegas the good news is that VMworld will be returning there next year and once again be at the Mandalay Bay. I was initially going to stay at the Excalibur for a ridiculously cheap rate, $45/night and that was for one of their remodeled Royal rooms, it’s all about location for me and I don’t care about fancy rooms. There is an express tram that connects Excalibur to Mandalay Bay which makes it easy to get there. However I was able to score a room at the Mandalay Bay through our corporate room block and my feet were rejoicing at the greatly reduced walking that they had to do. After holding at around 23,000 attendees the past few years, VMworld attendance seems to be on the decline this year. According to VMware there were around 20,000+ attendees for VMworld US this year. Losing 3,000 attendees is almost a 15% drop, are less people interested in VMware and it’s ecosystem now then before or is something else going on? VMware has never stated what that mix of total attendees is comprised of but I can guess that it includes VMware employees, partners & booth staff, press and analysts and customers. How much of each is anyone’s guess, I’d say at least half of that number is made up of customers. It would be interesting to know what groups those 3,000 missing attendees were in. 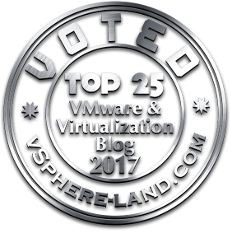 Are people just getting tired of Vegas, or are budgets getting cut, has VMworld jumped the shark finally or are sponsors/VMware cutting back on staffing? It’s probably a combination of all that , I know our company sent less people this year to support the event and hurricane Harvey certainly didn’t help matters either. In hot & sunny Vegas VMware was mostly talking clouds at VMworld. 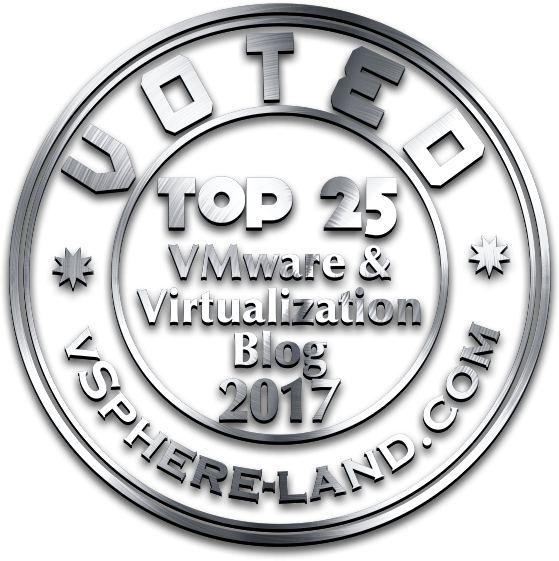 There were no new core vSphere product announcements at VMworld but there were a few announcements related to cloud focused VMware products. As VMware continues to get serious about securing virtual workloads they did announce a new product called AppDefense which is an application focused security layer built within their hypervisor. AppDefense looks to be a VMware built product rather than an acquisition that leverages some existing VMware frameworks to provide an application focused security layer around a VM. 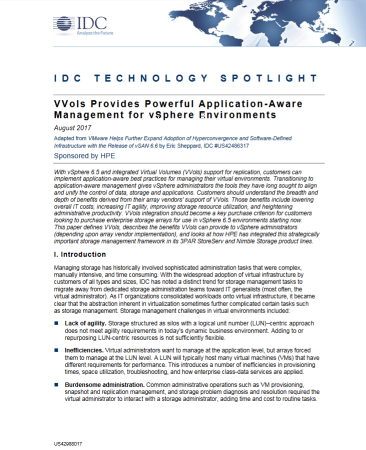 Rather than focusing at the edge where many of VMware’s security products operate AppDefense works at the VM-level to provide application security which can quickly isolate VM’s when needed to minimize damage from malicious software. VMware also announced general availability of their VMware on AWS offering but as of right now it is only available in the US West (Oregon) region but will eventually expand to AWS regions worldwide sometime in 2018. VMware also announced a collaboration with Google Cloud with a new product called Pivotal Container Service (PKS) which enables enterprises and service providers to deliver production-ready Kubernetes on VMware vSphere and Google Cloud Platform (GCP), with constant compatibility to Google Container Engine (GKE). In addition there were some announcements with various partners like HP, Fujitsu, Dell/EMC and IBM around cloud-based solutions. Also there were announcements around OpenStack, Network Insight and new vSAN offerings (HCI acceleration kits). I’ve been pretty critical of VMworld general session keynotes in years past, last year I thought they were un-exciting and boring. Many times the excitement level of keynotes is driven by NPIs but lately it seems many of VMware’s NPIs don’t align with VMworld. 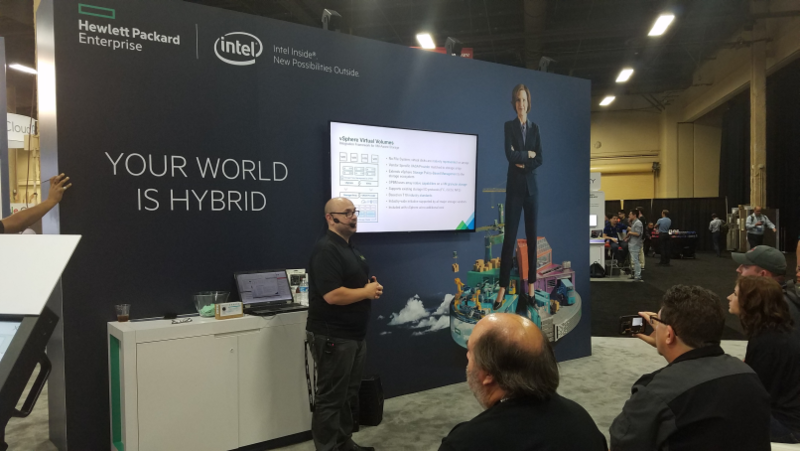 This year again there weren’t a huge amount of exciting NPIs announced at VMworld but I feel VMware did an excellent job of making the keynotes interesting and worth watching. The day 1 keynote featured CEO Pat Gelsinger and COO Sanjay Poonen who covered the state of VMware and the industry today, what they accomplished over the last year and then brought out a bunch of partners and customers to share their perspectives and tell their stories. We also learned a new term when it comes to security, “cyber hygiene”, you can read all about what that is here, which lead to the introduction of VMware’s new AppDefense product. All in all the day 1 keynote wasn’t super exciting but it held my interest enough to not be bored. The day 2 keynote featured CEO Pat Gelsinger opening up again and transitioned right away to a Q&A conversation from user submitted questions with Michael Dell who came out and joined Pat. Pat & Michael aren’t your typical corporate stuffed suits and are two very chill, down to earth CEO’s so watching them converse was enjoyable. Next they brought up Rob Mee, CEO of Pivotal where they announced a new offering, Pivotal Container Service (PKS) that is built on a Kubernetes foundation and integrated into Google Cloud platform services. With that announcement they then brought out Sam Ramji from Google Cloud to further discuss that partnership. Notice how VMware seems to be getting cozy with all the major cloud players these days. After that was over out came Ray O’Farrell, VMware’s CTO who introduced a scenario involving a fictitious company, Elastic Sky Pizza that was in trouble with their smartphone app and cloud based ordering system and needed help with their digital transformation. Next out came Chris Wolf from the CTO office and Purnima Padmanabhan from the VP of the Cloud Management group to walk through how VMware’s various products and services could save Elastic Sky Pizza and make them successful. There were various cut aways to pre-recorded ESP office scenes which felt a bit like a sitcom and also showing off some demos of VMware products in action but overall I felt it was very enjoyable watching it all unfold and made the keynote pretty fun and interesting. There were all sorts of great breakout sessions this year you can read about my top picks here. As usual I carefully build my schedule before the event and then once I’m at the event I’m lucky to have the time to see one or two of them with everything else going on. But that’s OK as they are all recorded, some even with video and available to attendees through the VMworld smartphone app or via VMworld.com. For non-attendees VMware has already released 40 of the top sessions to the public but unlike last year where they released all the session to the public this year they are holding back and may eventually release the rest of them at some point.. I had two breakout sessions that I spoke at, one was a HPE sponsor session on VVols Replication and the other was a VVols panel session hosted by Bryan Young the VVols product manager at VMware.I was a little disappointed this year at the attendance of our VVol Replication session given that we had over 900 register for our VVol session last year. 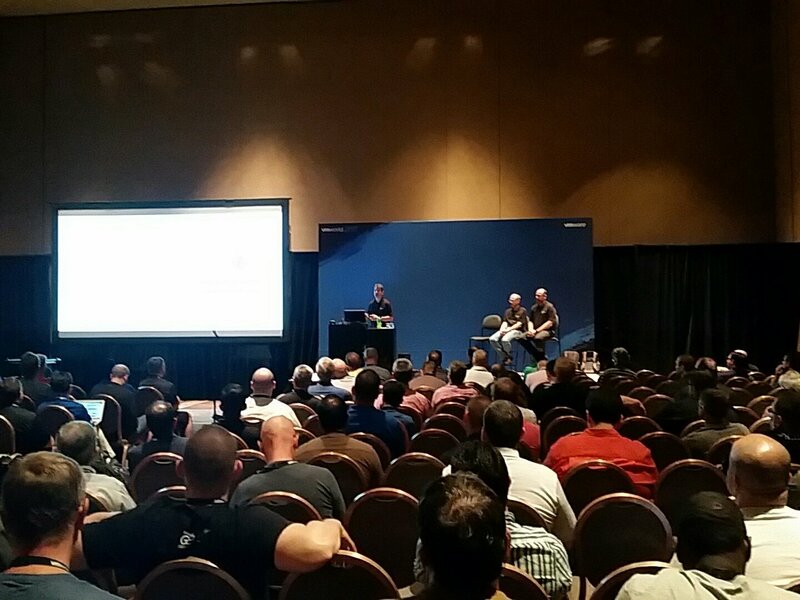 We had about 210 register this year and about 170 attend which wasn’t too bad, I thought we would have better attendance though especially on the distinct lack of VVols session at VMworld this year. The VVols partner panel had light attendance, around 65 people showed up, it was added very late to the catalog and was also held at the end of the day right when many people are winding down. 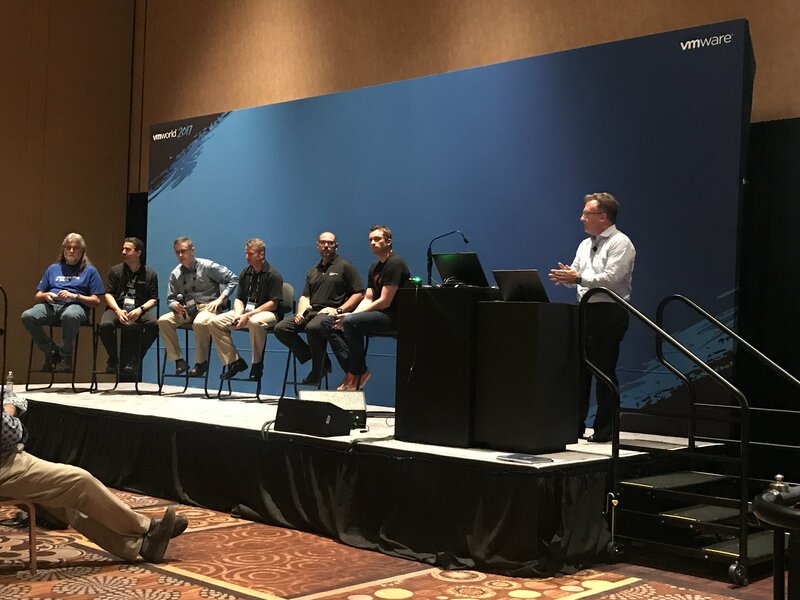 Despite that I thought it was fun and had a lot of good conversations around VVols, the panelists included myself and some good friends and acquaintances such as David Glynn (Dell), Andy Banta (NetApp/SolidFire) and Julian Cates (Nimble/HPE) along with a few others. There were some good (and tough) questions, Patrick Dirks one of the engineering leads for VVols and Pete Flecha were in the audience which helped out. 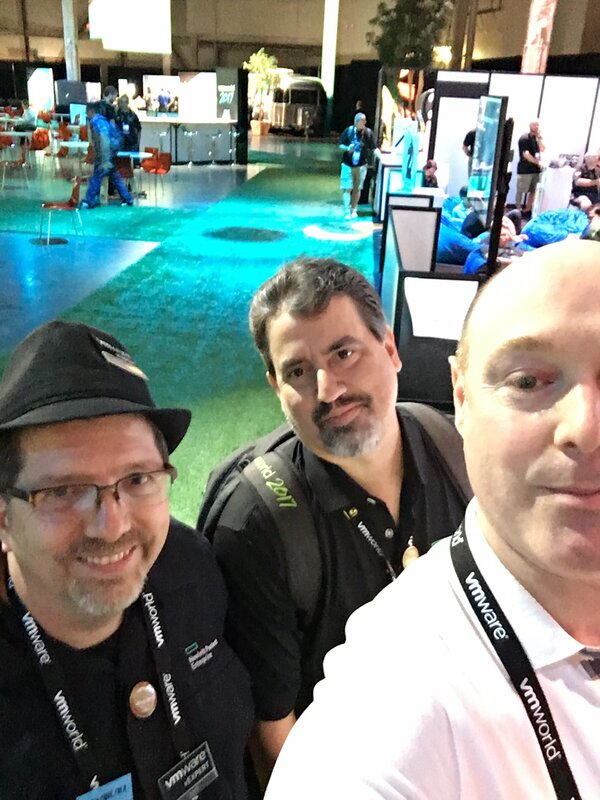 If you want to see a great VVols session check out the recording of Patrick/Pete’s VVols technical deep dive session which I heard had great attendance despite being on a Thursday. There was a lot of room in the Solutions Exchange and this year they had the VMvillage right next to it which was nice as it really cut down on walking and made for a unified area. 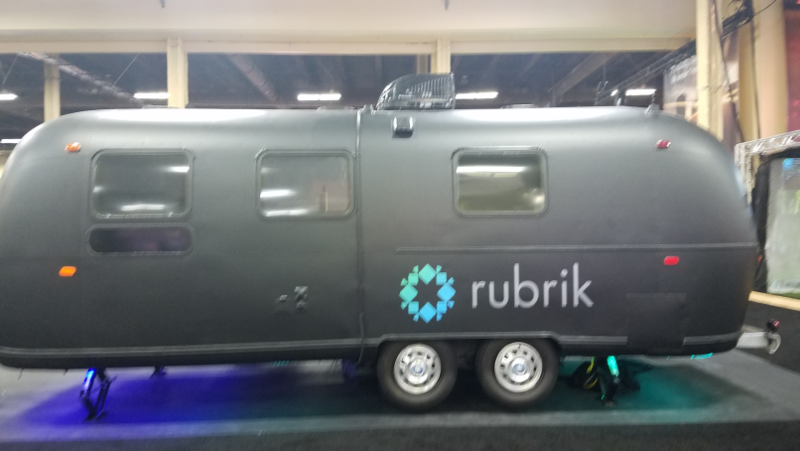 A saw a lot of smaller vendors going big their like Infinio and Turbonomic but perhaps the biggest splash was made by Rubrik who had a huge booth, an RV and a big basketball court which also featured an appearance by Kevin Durant, I found out he is actually an investor in Rubrik. Rubrik continued the big theme by hiring Ice Cube to play at their party. The Solutions Exchange seemed as full as usual with tons of vendors present and had good traffic throughout the show. The popular giveaway there this year seemed to be the fidget spinner with many vendors giving away branded ones. All learn and no play makes Jack a dull boy so the evening parties add a fun element after a long day of learning, walking and networking. On Sunday I attended the VMunderground party at the Beerhaus at the Park by New York New York, attendance wasn’t too bad there as it was more intimate and easier to talk with people. Afterwards was stogie time with a group of close friends including Jason Boche, Todd Scalzott and Shane Williford. Going on at the same time was the VMUG party which I missed once again this year. 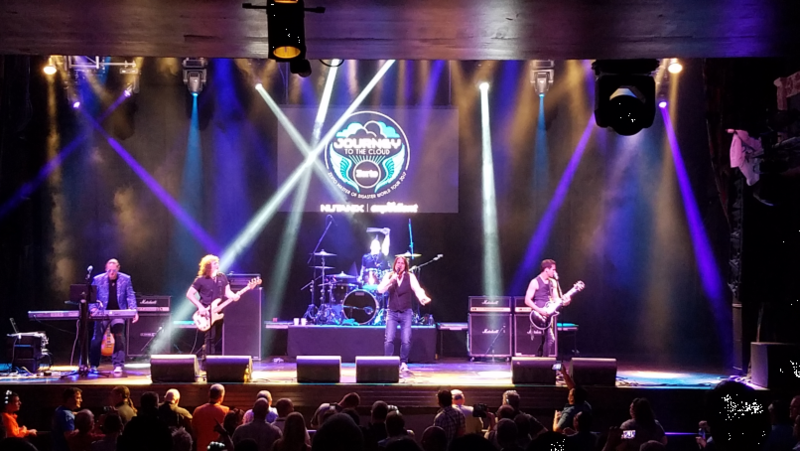 On Monday I went to Zerto’s epic Journey to the Cloud party at the House of Blues, I missed their ThunDRstruck party last year with a female AC/DShe band so I made sure to make the party this year. I have to honestly say that was the most fun party at the event, it featured an absolutely amazing Journey tribute band, Voyage, who looked and sounded just like the real thing, the singer looked like Steve Perry’s twin brother. Opening for them was a female Rolling Stones tribute band. Tuesday is always packed with parties and it’s hard to choose which ones to attend. 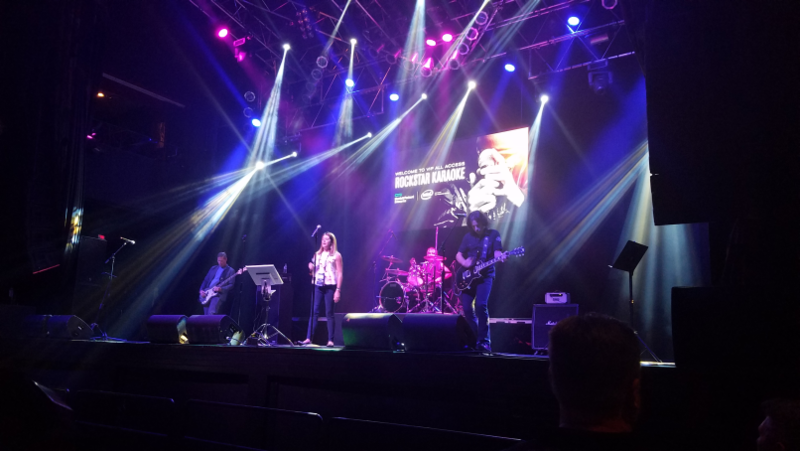 I skipped the vExpert party this year which was held at the Pinball Museum, I ended up going to the HPE Rockstar Karaoke party at the House of Blues. This was pretty fun as you get to sing karaoke to a live band. Afterwards it was off to the Veeam party which was at the MGM Grand in the Hakkasan ultra night club. 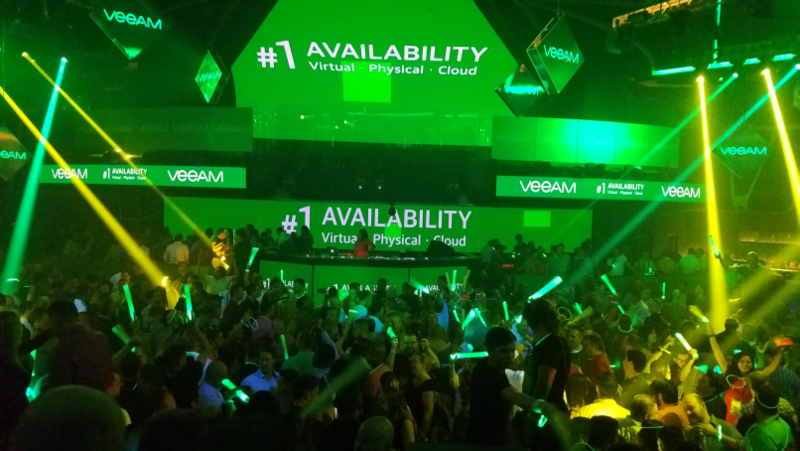 The Veeam party was epic and crowded as usual, I didn’t stay too long though as I’m not really into those high energy night clubs and it was insanely packed inside. Honestly I think some of the best Veeam parties were in San Fran at more traditional locations like the Metreon which had tons of space. Wednesday was the official VMworld party being held at the T-Mobile Arena which was across the street from Mandalay Bay. I was flying out Wednesday night so I missed that one, I wasn’t really into the band they had playing, Blink-182, if they had a band I liked more I probably would of stayed until Thursday and attended the party. Overall I thought it was an excellent show and as usual the event execution was fantastic and seemingly flawless. Mandalay Bay is a great venue for VMworld and it’s good to see it returning there next year. It will be interesting to see what the attendance looks like next year to see if this year was a fluke or if it’s really on the decline. This was the first VMworld since the Dell merger closed and it looked like VMware has done a fairly good job of staying independent at the event. While Michael Dell was part of the keynotes there was also people from competitors like IBM and HP participating as well. It’s real fun attending these events under Pat Gelsinger as he’s almost the complete opposite of former CEO Paul Maritz. Where Paul seemed more stiff, formal and business-like, Pat is a lot more easy going, geeky, fun and down to earth. Overall I had a great time networking with peers, customers, friends, co-workers and VMware employees at VMworld. It’s always a bit sad when you have to leave but overall I leave feeling both energized and highly satisfied with a renewed drive to stay committed to the technology that I love and I can’t wait until next year when we get to do it again. Thanks VMware for another great event! 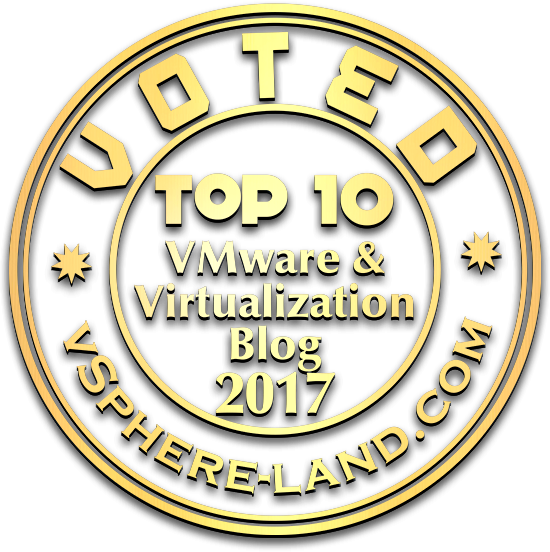 Hot off the presses are new logos for your blog/website to show off how you did in Top vBlog 2017. I was going for a new look this year and hence had to find a new designer which was no easy task. I use Fiverr which is a huge community of freelance designers for hire for a relatively decent price but finding the right designer that can do good work and meet your expectations can be a challenge. I went through 3 designers that were pretty awful before I found one that was very creative and nailed my design on the first try. I paid a good penny to get the logos done, those $5 designers are best avoided but I’m very satisfied on how they turned out. I took the logos that they delivered to me and ran them through GIMP to crop and re-size them without losing transparency. I’ve attached below the larger cropped logos and the smaller cropped/re-sized logos that fit better in a blog sidebar. So if you made the top 100 this year, download your appropriate logo and let everyone who visits your blog know about your accomplishment.